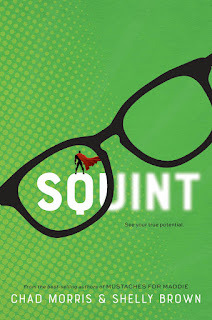 SQUINT by Chad Morris and Shelly Brown. This was an incredible story. It had me captivated till the end. The timid relationship between Flint and McKell is amazing to see develop. How they both help to push one another in their own struggles, and help build and support one another is a powerful lesson that we could all use more of in our lives. I would recommend this book to any and everyone. Absolutely amazing. The hero of my comic book can shoot lasers from his eyes when he squints. But it might not be enough to save the Empress. What he'll need most of all is a friend named Diamond Girl. Flint loved to draw. In fact, he's furiously trying to finish his comic book so he can be the youngest winner of the "Find a Comic Star" contest. He's also rushing to finish because he has an eye disease that could eventually make him blind. At school, Flint meets McKell. She's new and doesn't seem to have trouble making friends. She does have a problem with how some of her new friends treat this boy they call "Squint." He seems nice and really talented. He also seems like the kind of person who wouldn't laugh at you. 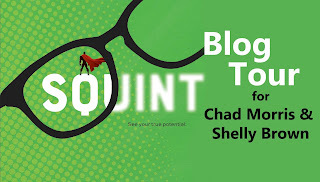 That's important, because McKell has hidden talents of her own but is worried about what will happen is she shares them. Squint is the inspiring story of two new friends dealing with their own challenges who learn to trust each other, believe in themselves, and begin to truly see what matters most.